Adults living in Southern California have the benefit of year-round weather that allows for enjoying plenty of time outdoors. Because of this, most homeowners in San Diego County, Orange County and the surrounding areas place an emphasis on comfortable, functional outdoor living spaces and incorporating outdoor entertaining areas in their backyard landscape design. But adults are not the only ones who can benefit from a well-designed backyard; children who are fortunate enough to grow up in Southern California with the ability to play outside any month of the year can also benefit from outdoor play spaces that allow them to have fun with their friends in the fresh air and sunshine. Many families with small children invest in quality playground equipment or a sandbox for their backyards, and these features are pretty much a must-have, but parents who want to broaden their children’s imaginations and provide expanded opportunities for learning and having fun can go beyond these backyard basics. Outdoor living areas designed just for kids are a great way to provide your children with unique play spaces that will pique their interest and help keep them busy with positive activities while you work from home or take care of household tasks. 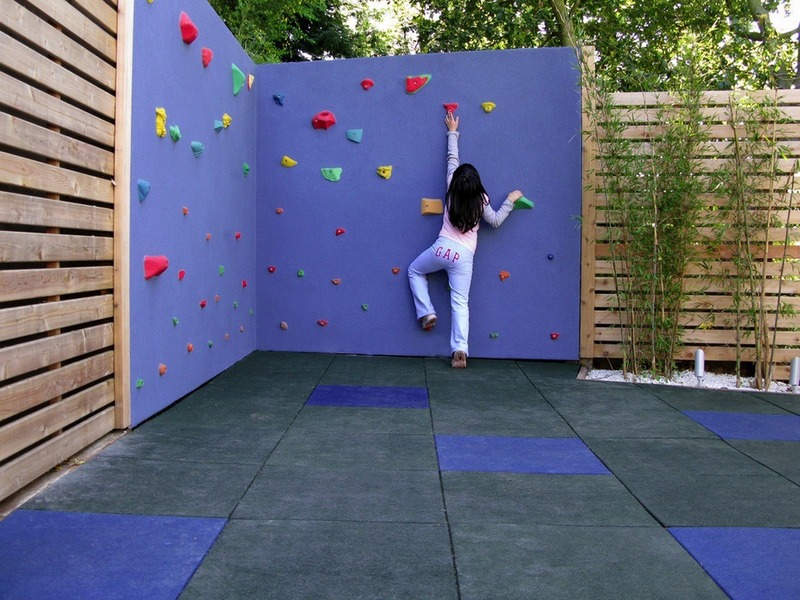 Read on to explore some fun ideas for creating a one-of-a-kind outdoor play area for your kids, and get inspired to design a personalized play space tailored to meet the needs and interests of your children without taking away from your overall landscape design. Here are 10 ideas for creating outdoor living areas for kids. Dedicate a portion of your patio to a small stage set up for singing or putting on plays. Make sure the stage is low to the ground to avoid injury if your little actress is overcome with emotion during her soliloquy and gets a little too close to the edge. If you happen to have any old curtains around, you can add a stage curtain that can be opened and closed for productions. You can also include a weather-resistant trunk or wardrobe that you can fill with whimsical costumes for use when putting on a production or just playing dress up. A karaoke machine is a worthwhile investment if you have a budding singer in your family, particularly if you can also use the stage and karaoke machine to provide a fun activity for your adult guests at your next outdoor dinner party. There is nothing quite like grilling up burgers with your best friends after a long week at work. We love our grill-centered gatherings so much that barbecuing has practically become an art form, and elaborate built-in barbecue grills and outdoor kitchens bring us a sense of pride and quite a bit of enjoyment. 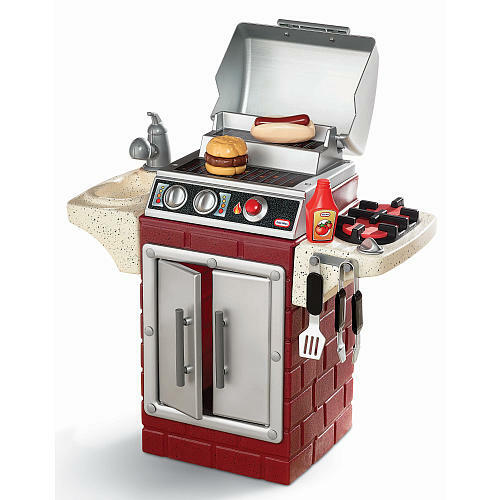 Now kids can get in on the fun with outdoor kitchens and barbecue grills designed just for little ones with plastic utensils, faux food and itty bitty condiment bottles. This means you can set your kids up with their own little outdoor kitchen, buy some matching aprons and grill side by side the next time you have company over for dinner. Of course, you will want to make sure your kids understand the difference between their very safe little grill, and the big one you use that could burn them. You will also want to make sure their plastic kitchen is a safe distance from where you will be cooking outdoors. Add a kid-size picnic table and tableware, and your son or daughter will be all set for an imaginary barbecue on their next play date. Having a tea party with our teddy bears sitting around our tiny tea table is something from childhood that many of us look back on fondly. With the great weather we have in San Diego, there is no reason for our kids not to take the tea party outside on the patio or in the garden. With little more than a small table, chairs and the cutest tea set you can find, you can set up the perfect spot for your son or daughter to host their own garden parties right in your backyard. This will also come in rather handy when you have friends over for a garden party of your own, since the little ones can have a concurrent tea party just a few feet away. You can expand on this idea and make it an educational opportunity by teaching your son or daughter how to sew cushions for the chairs or how to embroider tea towels. Your children can also begin to learn about baking by helping you make tiny treats for their next soiree or learn table and party manners that are sure to come in handy as they grow older. Everyone needs a room of their own where they can escape from everyday stressors, relax or partake in their favorite hobbies. Outdoor rooms are a great way to expand the usable living space of your home, and outdoor playrooms are no exception. Creating a pint-sized outdoor living space just for your kids is the perfect way to provide them with a space that is all their own where they can read, color or just get away from everyone for some alone time. 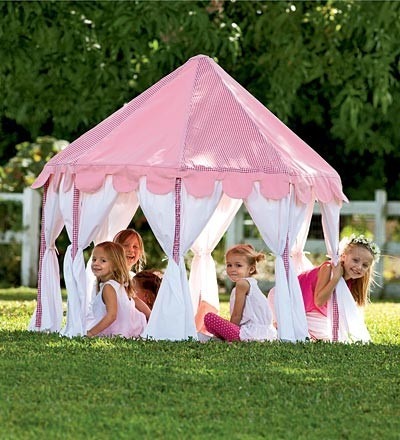 Creating an outdoor playroom can be as simple as setting up a seating area in a corner of your patio or in a more secluded garden space, but one of the easiest – and most attractive – ways to install an outdoor room for your children is to invest in an affordable play tent you can easily set up in your backyard. Options include everything from pretty pink pavilions to pirate-inspired pop-up tents, some of which can be purchased for less than $100. This makes for an easy play area that can be set up in a single afternoon and bring your child hours of enjoyment far into the future. If you invest in a permanent structure, you can enlist their help in decorating it to give it an even more personal touch and make it a space that they can truly claim as their own. 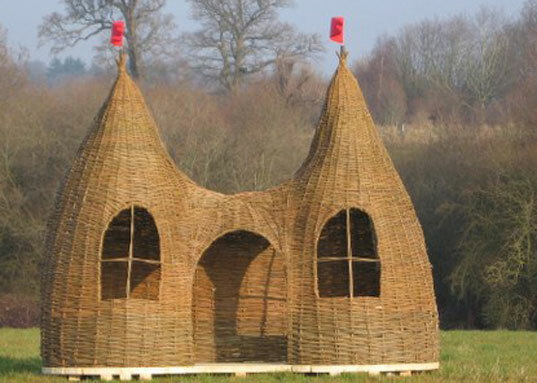 Playhouses play an important role in childhood, and many adults fondly remember wiling away many afternoons playing house with their best friend. 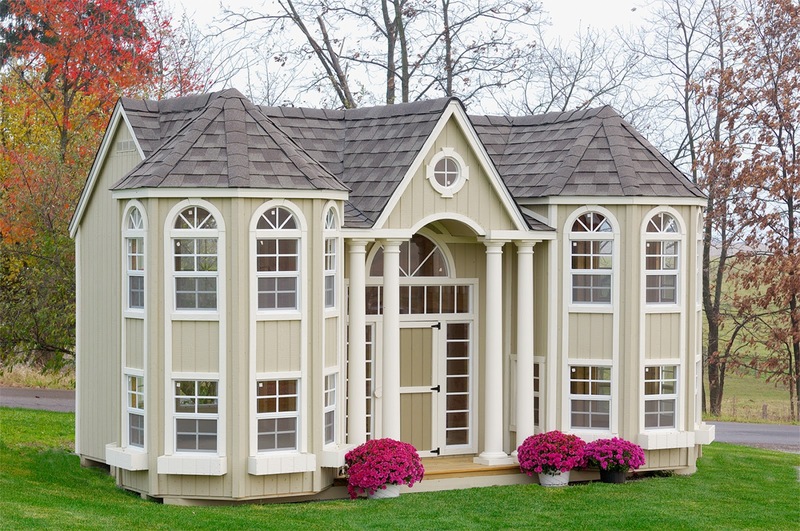 When most of us were growing up, playhouses came in some pretty standard shapes and sizes, but today’s playhouses can be shaped like hobbit holes, pirate ships, castles or just about anything you can dream up. Nothing sparks the imagination quite like a fairy garden with a fairy village, garden gnomes and a butterfly garden. This whimsical addition to your backyard is sure to inspire plenty of imaginative play while also providing your children with a relaxing place to escape to after a long day at school. 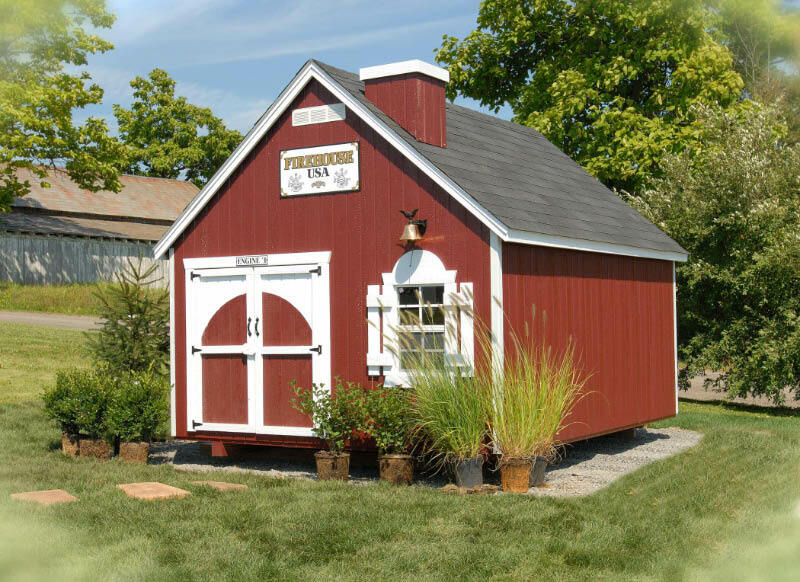 Pre-made fairy cottages can be purchased online or at some larger toy stores, or you can make your own by decorating a tent or playhouse with images of flowers and fairies. This goes perfectly with a white garden, butterfly garden, hummingbird garden or other themed garden, if you happen to already have one in your backyard, but you can also set this up alongside a flowerbed to make sure there is plenty of flora in your child’s fairy garden. Gardening with your children is a great way to teach them how to take care of things, help them understand where food comes from and teach them about nature. 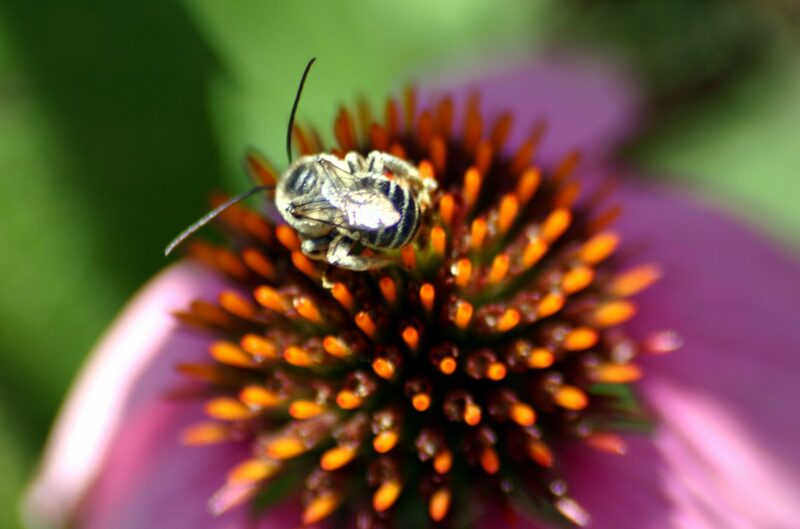 Creating a children’s garden is easiest when you do so alongside your own grown-up gardens. For example, if you have a vegetable garden, you can set aside a section for your children to plant and tend. If you are not that into vegetable gardening, but do enjoy growing flowers, you can make one of your flowerbeds a kids-only zone where they can grow their own flowers and learn how to water, weed and care for a little garden of their own. If your child shows an interest in growing things, you may want to invest in an inexpensive potting bench made for kids or child-size flower planters so that they can work alongside you as you plant seedlings or flowers. Inspire your child to explore and learn about history with their very own archeological dig site in your backyard. Before you start picturing your child digging up your flowerbeds or tearing up your lawn, keep in mind that this is the perfect way to make a sandbox a whole lot more interesting while also keeping the digging to a designated area. Rope off the sandbox like a dig site, provide some little shovels, bury some treasure in the sand, and let your kids spend an afternoon looking for dinosaurs and remnants of civilizations lost to history. You can make this a great educational opportunity by burying items specific to certain cultures and teaching them about the culture or burying toy dinosaurs and teaching them about each species as they uncover them in the sand. To complete your backyard archaeological dig site, set up a tent with a cot, a table and a journal in which they can record their findings. If your child loves his or chemistry set more than any other toy, you might consider setting up a backyard laboratory where they can do experiments with their friends, collect insects and learn about science. Letting them create safer explosions with vinegar and baking soda requires much less cleanup when done outdoors, which makes a backyard laboratory the perfect outdoor play area for budding scientists. Nature provides some fantastic inspiration to those who are artistically inclined, which is precisely why your little artist needs an outdoor art studio where she or he can draw, paint or color. An easel, water-based paints and washable markers are all you really need to set up a mini artist’s studio in your backyard, but you can expand your child’s creative play options even further by painting a section of your fence or wall with chalkboard paint. This easy, DIY project is a great way to create a space where your child can play teacher or draw masterpieces without you needing to worry about chalk getting on the couch or markers being used to redecorate your living room walls. You can also mount a whiteboard or chalkboard to a fence or wall, if you are not so keen on painting a permanent chalkboard with chalkboard paint. Creating a unique play area for your child lets you use your imagination and creativity to provide them with an outdoor living space that will broaden their imagination and encourage them to be more creative as well. If you want to encourage your child to be more active, you could install a tree swing, a climbing wall or a trampoline. 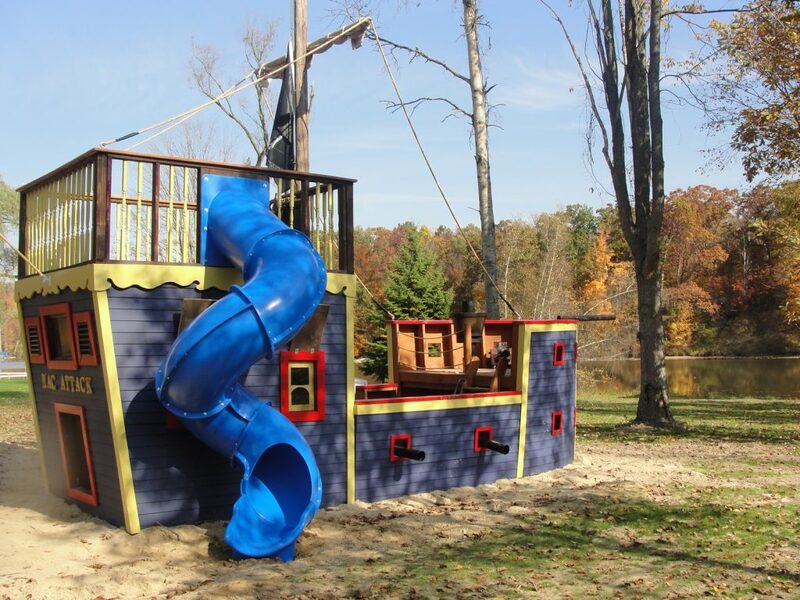 If you want to inspire creativity or imaginative play, a pirate ship, mini art studio or archaeological dig site is good choice. Outdoor play is an important part of childhood, and with the huge variety of play equipment, tents and playhouses available today, it is now easy to provide a great play space for your child that will not take away from your overall landscape design. Do you have a unique play structure or play area in your backyard? If so, we would love to hear about it in the comments!